We need to catch up on our last month in the US, however we arrived in the Bahamas in the early hours of 21st December 2017 - exactly a year to the day that we arrived in Barbados (not planned). Since then we have been hanging around near Grand Cay which is really remote and very beautiful. This is part of the Northern Abacos. This is where we are anchored - top left is Askari - can you spot the shark?? We arrived on the Little Bahamas Bank, after crossing the Gulf Stream, at 4pm on 20th December 2017. We had light to see the depth come up from over 700 metres to less than 10 metres in the space of a mile - this creates some crazy conditions and I honestly thought some of the waves were square. We had about 15 knots of wind from the South West but the sea was so short it really was quite yuck for the last hour. It was about 30 hours sail from St Augustine Florida. We had some great charts (Explorer) that provide some safe deep routes so we cautiously followed these in across the bank in the dark, sailing really slowly under shortened sail. I slept most of the tricky bits and Andrew brought us into Little Sale Cay where I got up to drop the anchor in 4 metres of water just behind the island - we had our best bright lights on and could see the bottom even in the dark at 2am. 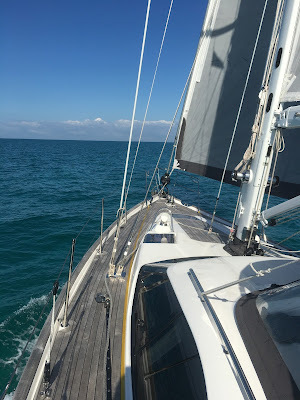 The next morning we had a fabulous sail back up to Grand Cay to clear in. We came back and cleaned the boat and had our first swim in the crystal clear waters of the Bahamas. The next morning we finished our jobs from the passage and then went to explore and found we were actually in paradise, with our own sand cay to play with just behind the out crop we were anchored behind. I think it will take us alot to encourage us to move on from here - well while the weather stays nice. Looking quite pleased with himself - and so he should! Andrew flew the drone from the sand cay, although it's a bit wonky as the calibration was done on the paddle board which was on a slope..... We had the best day paddling, flying and swimming - we went into one cove and about 8 turtles went flying off, then a huge spotted eagle ray swam by. Toys are out to play! Our first sunset in the Bahamas - wow! !